⚓ T61395 "hide_viewport" conflict with drivers. 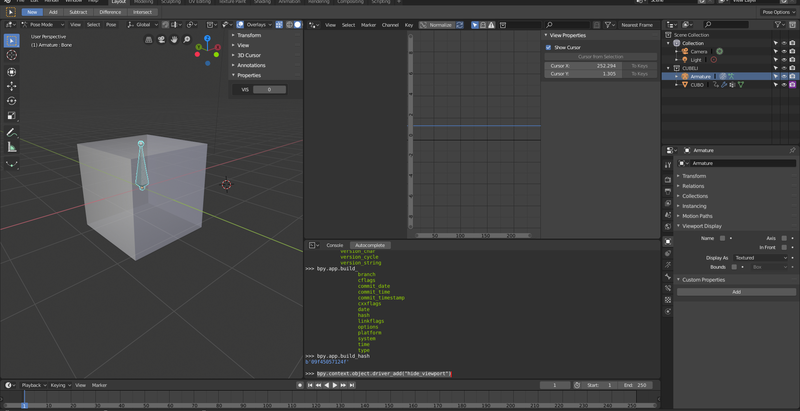 The visibility (hide_viewport) is not refresh in viewport. I set the Cube driver on this way >>>> bpy.context.object.driver_add("hide_viewport") <<<< classic way. Select bone and change custom property (VIS). rB09f45057124f: UI: Color Picker, make HSV default. I think animating the viewport visibility is not supported atm, not sure if that changed. And tbh, I don't know why two icons change in this file when changing the VIS property. Juan Pablo Bouza's blenrig also uses it. I think it's a very important option. At least we need an alternative that does not calculate the mesh.